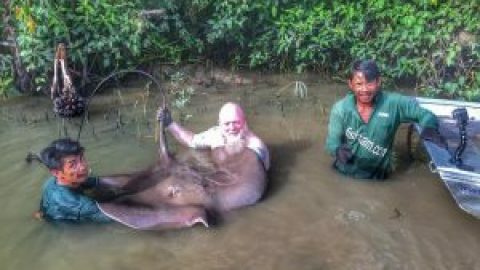 Bangkok angler Brendan and Bill O’Connor teamed up to target the infamous predators of Lake Monsters. Fishing a variety of tactics the anglers landed a double figure haul consisting of several Redtail Catfish and various other predators. Brendan fishing the first part of the day with method tactics experienced a quiet morning until his peanut stringer hookbait was picked up by a large Rohu of over 20lb’s. Bill who is the creator of the modern angling website and forum was not to be out done and went on to capture numerous predatory species topped by a large 30kg Redtail Catfish and a highly sought after Black eared Catfish weighing an estimated 23lb’s. These captures follow Bill’s recent record breaking and unreported triumphs with specimen Asian Redtail Catfish in previous months from this record breaking venue.